Luke, you were two months old yesterday. Time is flying by! You have changed so much over the last month and it's so fun to watch you grow and change and watch your little personality come to life! This post is a day late, but I waited until we got your stats from your doctor's appointment today. You weigh 14.2 lbs. (95th percentile), you were 23.25 inches long (5oth percentile - although I think you are longer because your little legs were bent when she measured), and your head is 16 inches around (75th percentile). 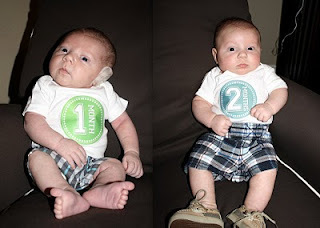 You also had your 2 month shots today - a day mommy has dreaded since you were born. You cried for about 30 seconds and then fell asleep. Such a little champ! You are wearing 0-3 month and 3 month clothes and some 3-6 month clothes. You are growing so fast and most of your 0-3 onesies are getting tough to button. You've completely outgrown all your 3 month Carter's clothes! Nana and I went Christmas shopping last weekend and bought 9 and 12 month clothing - makes me sad to see you growing so fast, but also super excited for what's to come. You are such a good sleeper and I love to brag on you when people ask how you sleep. You still follow the Moms on Call/Baby Wise schedule and take a bath between 8:30 and 9 each night, directly followed by a bottle and bedtime. You sleep until around 6am, take a 5 oz. bottle and then go back to sleep until 8:30 or 9am. Sometimes you'll get fussy at around 3, but all you really want is your paci and you're good to go for another 3 hours. We are so blessed to have such a good sleeper! You are doing better at eat, play, sleep now. You wake up more each day and after you are fed and changed, you love to sit in your bouncy and talk to me or giggle and laugh. You'll play and talk for about an hour or so and then you usually take a good nap until the next feeding. Sometimes you will stay awake all day (mostly on the weekends), but we try our hardest to keep you on the eat, play, sleep schedule. You still eat 5 oz. every 3 hours. Sometimes you'll get fussy in between those feedings and we'll give you a Similac 2 oz. bottle to tide you over. That generally seems to do the trick. You are still on Similac Advanced and it works well for you. We still put a little mylicon in the bottle and you're usually quite happy after your bottle. You are so strong and can hold your head up like such a big boy. I can carry you around and you support your neck completely on your own. You only bobble now once in a while. We sat you in your bumbo last weekend and you didn't quite know what to think of it. You did really well and mommy only had to help support you for a second or two. You have quite the personality. You are really ticklish under your chin and will just laugh and laugh at Daddy and I when we rub under your chin. You love to talk and babble and some of your "words" sound a lot like "daddy" and "no". We laugh because although that's probably not what you are saying, it happens to sound like that at the most perfect times. You don't really cry unless you are hungry or very tired. You love to cuddle and you must have your paci when you are tired; the paci is so soothing to you. You also still sleep with the white noise every night and you also love to listen to Baby Einstein radio on Mommy's iPhone. You went to the church nursery for the first time this month. You did so good and the nursery workers didn't want you to leave. It makes me so happy to see you happy and doing well at church. You are being dedicated next month, and I'm excited to watch you grow up in church, learning all about Jesus and learning to trust Him and love Him. You are quite the social butterfly. This past month, you went to Houston for the first time to meet your great grandpa and all of Mommy's family. A week later, you went to Austin to meet both sets of your great grandparents and some of Daddy's family. You had such a fun play date with Taryn while Mommy and Daddy went out for some wedding festivities, and then you got to go to Caroline and Ben's rehearsal dinner (until Nana and Papa came to get you so you wouldn't have to sit through dinner!). Everyone loved your little Ralph Lauren outfit and RL loafers that Caroline gave you. Last night, you went out for Richard's birthday party at TABC and met a lot of mommy's friends. During dinner, you experienced your first big rainfall (Dallas is in the middle of a severe draught!). Even sitting outside under the patio where it was quite noisy, windy and wet, you were so good and didn't make a peep the whole time. You also went to your very first Rangers game with your Pappy and his friends (your cousin Mallory's friend Flat Stanley came too)! It was really fun, but we couldn't stay past the 5th inning because it got chilly and very windy and mommy didn't want you to get sick. We covered you up with blankets, and when you got bored, you went to sleep and were so good. You are always so good when we take you out; it's been easy to go lots of fun places with you. This month, your Nana and Papa came to visit you and watch you for a weekend while we went to parties for Caroline and Ben. You love your grandparents so much and everytime I say that Nana and Papa are coming, you get a huge grin on your face. They always spoil you, and Papa and you have a special bond. I think it's because you are his first grandson and he now has someone to teach to play golf! No more shopping with the girls! You start school this week, and Mommy is so sad to go back to work. I know you'll do great and make lots of friends. I know it will be tougher on me than on you. Lukester, Mommy and Daddy love you so very much. You bring so much joy to our lives and we can't imagine our lives without you now. You are the most special little boy and everyone who meets you loves you. Although our lives have changed drastically since July 19th, it's been for the best and I wouldn't have it any other way. You are our sweet, sweet angel baby.